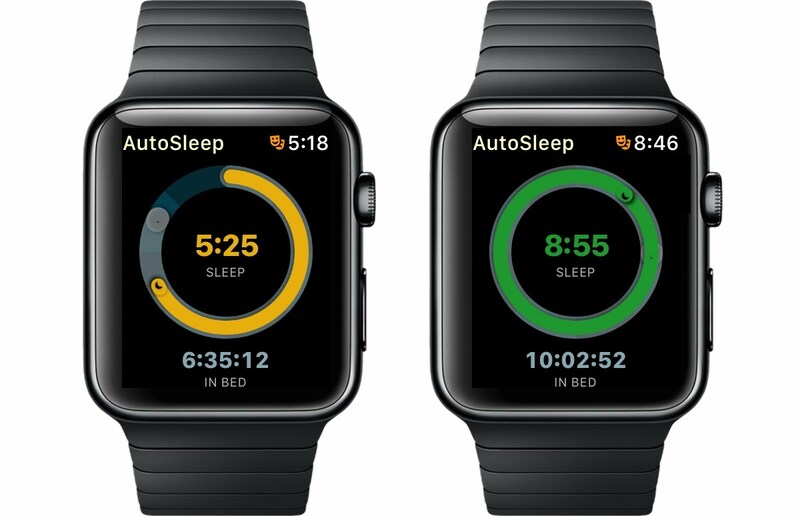 The AutoSleep Watch app isn't required to track sleep, but in AutoSleep 6 it has some fantastic new features. The Watch app menu doubles as a quick overview of your sleep as well as a means to dive into other Watch views. Each icon is colour keyed using the AutoSleep colour rating scheme. Sleep: This shows your last sleep time and your current sleep bank status. Credit is represented by an up arrow, Debt by a down arrow. Quality: This gives information about your sleep rings. It shows your quality sleep time, your deep sleep time and your heart rate. Readiness: A colour keyed icon and star rating for your day's readiness. If you have not yet done a "Breathe" session it will provide instructions. Summary: A rating based on your sleep ring completion and access to a summary of your sleep. Lights Off: This lets you tell AutoSleep that you are going to bed so that it can track your time to fall asleep. Note that the quality rings and summary information are only displayed if you wear the Watch to track sleep. Once you have selected an option. you can scroll using the digital crown. You can also swipe up or down on the screen to quickly jump through each section. You can tap the top of the screen to return to the top. This shows your day's sleep so far and your current sleep bank balance. This shows your quality, deep sleep and heart rate sleep rings. This shows your daily readiness rating, both on a gauge and with the associated star rating. Beneath this is your waking HRV reading in milliseconds with a colour keyed indicator showing the difference to your current baseline average. To the right is your waking pulse in bpm with a colour keyed indicator showing the difference to your current baseline average. This shows your sleep ring rating, today's sleep, today's quality sleep, average sleeping heart rate, time in deep sleep and time spent awake or disrupted sleep. Touch the big Lights Off button to tell AutoSleep you are going to sleep. This lets you track time to fall asleep and also then displays the Live Updates view below. There are two ways to see live sleep updates. 1. If using the Lights Off feature (which is explained here) then there is a live progress view that has been optimised for night time use. This displays how long you have been in bed, and how much of that time you have been asleep. This is presented as overlapping rings as a percentage of your required hours sleep setting (from the Wizard tab). This view will update whenever you look at the Watch screen. If so inclined, you can also scroll to see the quality sleep, average heart rate and deep sleep progress. 2. Whenever you go into the Watch app it will refresh and show your current sleep. If using Infograph complications then the complications will update roughly every 15 minutes so that you can see your sleep ring and sleep bank status. The InfoGraph complication will update every 15 minutes as you sleep and shows time slept as the outer ring and your current sleep bank balance as the inner ring. The Watch app will use its own locally captured health data and perform its own sleep calculations up until the iPhone app has been unlocked and had sufficient time to determine your sleep. Once the iPhone app has finished processing, it will update the Watch app with your sleep data.